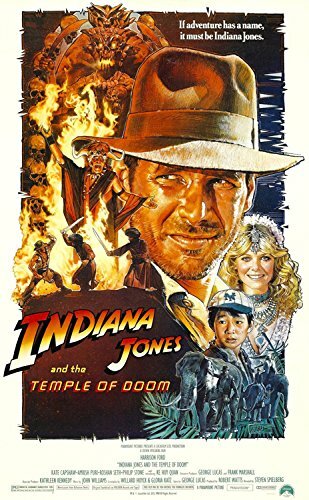 The second film in the Indiana Jones series was quite a step down from the brilliance of Raiders of the Lost Ark, but it was still a good time. Indiana Jones and the Temple of Doom took the archaeologist into a prequel and made it a much more pulpy type serial than we got in the first one. Indy starts out in Singapore trying to make a deal for a diamond, but that deal falls through. The opening bit of the film is not very effective as it depends too much on slapstick and silly coincidences. It also introduces us to the singer and this film’s love interest Willie Scott (Kate Capshaw) and Indy’s sidekick Short Round (Jonathan Ke Quan, who later stars as Data in The Goonies). There is just no denying that Temple of Doom is several steps down from the Raiders of the Lost Ark, and that the film suffers from the portrayal of the Indian villains of the movie as bloodthirsty cultists and that this would be considered seriously racist these days. Some people include Short Round in this mix, but I do not. The young boy is one of the highlights of the film here, filling the young sidekick trope that these types of serials would have. Short Round is shown as capable and heroic and I take nothing from the broken English. I am sure that is how the actor spoke. There are plenty of racist parts to Temple of Doom without adding Short round into the discussion. And the relationship between Indy and Short Round feels real and sweet. It feels as if they have been together for years and have grown into a close knit pair. This, of course, begs the question of exactly what has happened to Short Round after this movie as there is no mention of him in Raiders of the Lost Ark or the remaining films. Did Short Round meet with a terrible fate on an adventure? This falls into the category of white savior films as the white man arrives and saves the day for the Indian people, who apparently cannot do it for themselves. And the mysticism of the film adds another component to the question of race relations. That mysticism angle just does not work as well for Indiana Jones as does the adventure and swashbuckling action, which is why the action picks up drastically when the film gets away from the mystics and the mind controlling blood and features on a mineshaft chase scenes and a final confrontation on a rope bridge. These moments feel like classic Indiana Jones and help elevate the remainder of this. I was not a fan of Kate Capshaw and her role as Willie. She was more annoying than anything else as the helpless, dumb blonde. She was nowhere near Indy’s equal as Marion had been, and, had we seen Willie first, maybe we would have liked her more. In the end, Temple of Doom is a good, but not great Indiana Jones movie. They took away the parts that worked best for Indiana Jones and tried to add in a different kind of pulp story that was not as effective. Still, Harrison Ford is always entertaining and Short Round was a fun and interesting addition (and way more than just a racial stereotype).